This blog is part of our SQL tutorial. If you're looking for a classroom course, have a look at our SQL classroom-based training. There are two types of table-valued functions (or TVFs) in SQL: in-line table-valued functions, and the grotesquely named multi-statement table-valued functions. This blog considers both! Out of all the many ways to refer to sets of rows in SQL, I think TVFs are the most powerful (just shading table variables, temporary tables and common table expressions). 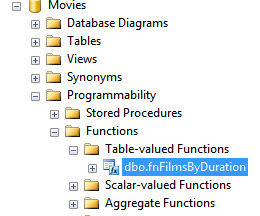 The function fnFilmsByDuration above is called an in-line table-valued function, and the next part of this blog will show how to create it. Where to find your table-valued functions (my colleague Andrew has covered scalar-valued functions in a separate blog). If you think you've created a table-valued function and can't see it in this list, there are two obvious things to try: first right-click on the category to refresh it and see the latest contents, then if you still can't see your function check that you've created it in the correct database!